Montgomery Gentry’s Eddie Kilgallon joins SWHS music groups March 16 to raise funds for Challenge Day. Sedro-Woolley High School’s Challenge Day program is about to get a celebrity-sized shot in the arm. 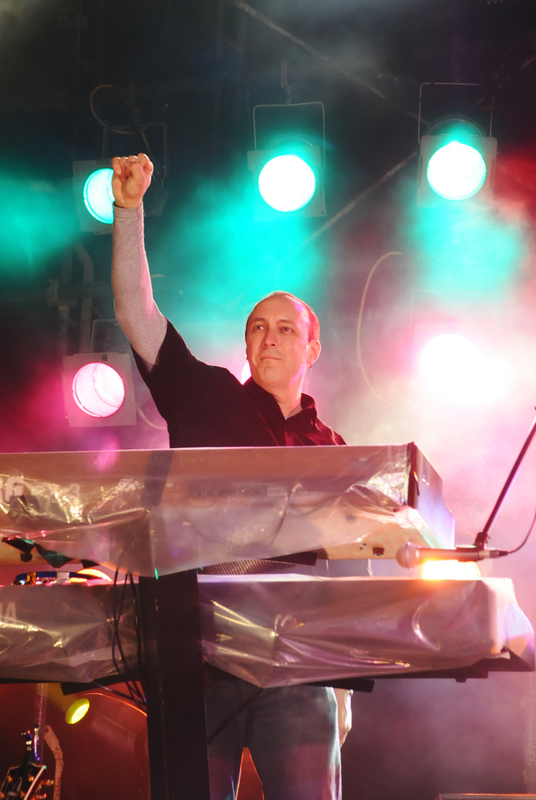 On March 16, Montgomery Gentry’s band leader and keyboardist Eddie Kilgallon will step on stage with the SWHS band and choir for a benefit concert. Their goal is to raise the almost $13,000 needed to administer Challenge Day at the high school this fall. The Challenge Day program is an eye-opener, said SWHS Assistant Principal Jeff Ingrum, who brought it to school in 2006 with school counselor Debra Smith-Hicks. He experienced Challenge Day while teaching in the Lakewood School District, and “it blew me away.” Ingrum, who is a member of a local band named “Cousin Eddie,” will at one point share the stage with Kilgallon. The Challenge Day program lasts for three days and immerses students in conversations that are designed to help them understand their similarities. The program’s intent is to lessen the amount of bullying and harassment among students. “It’s not a silver bullet, you’re always going to have bullying and harassment, but it brings common language to students and staff” to help them deal with problems when they arise, said Ingrum. Above: Montgomery Gentry band leader and keyboardist Eddie Kilgallon will join Sedro-Woolley High School’s band and choir for a March 16 concert. The fundraiser aims to generate $13,000 to pay for the school’s Challenge Day program this fall. Submitted photo. 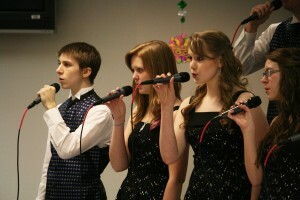 Left: Members of the Blue Horizon Choir. 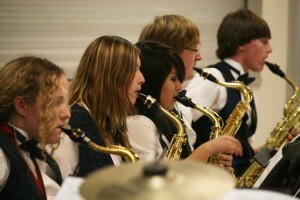 From left, Andrew Critchley, Colleen Cummings, Taylor Huckaby-Vallejos, Kelsey Hamlin. Photo by Joshua Jordan. Above left: From left, Sedro-Woolley High School Jazz Band saxophonists Annie Murray, Ashley Clumpner, Fabiola Yupari, Jeff McDougle, Jake Elliot. Photo by Joshua Jordan.